A modern wedding invitation by definition would be strong lines and bright colors. Squares, circles and stripes all lend themselves well to the modern wedding invitation. When choosing fonts, a larger, bold font that has straight lines will feel more "modern" than a font with "feet." As a general rule, modern wedding invitations are much more colorful than their traditional counterparts. Traditional wedding invitations are usually white or ivory cardstock and use script font. Color can be used is many different ways to give the modern feel to your wedding invitations. Using bright, bold colors is a great way to achieve a very contemporary style. Also, using rounded corners and pocket folds are additional ways to give your invitations a modern style. Most of the elements for modern wedding invitations are the same as for traditional wedding invitations. They need to include the couple's names, the date, time and location of the wedding and who is hosting the wedding. Many modern invitations will also give information on the attire that is required and the registry information. One of the most important things that will differentiate a modern wedding invitation is the paper. This is arguably the most important element. 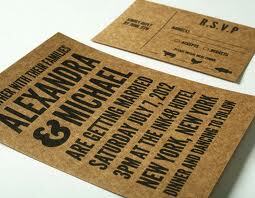 Many modern invitations use hand-pressed papers which are ideal. These high quality papers are usually extremely expensive, but are well worth the cost. Many couples choose to have handmade invitations if they are choosing a modern design. There are some downsides to this, however. Many times, a handmade wedding invitation can end up costing considerably more than a traditional invitation. Also, do it yourself wedding invitations can be very time consuming. Of course, handmade invitations can be ordered rather than doing it yourself. This may or may not add to the cost. Sometimes, it is just as expensive (if not more expensive) to make your own invitations as it would be to have them custom designed and made for you. When designing your modern wedding invitation, keep in mind a few guidelines. Colors are generally bold and/or bright. Shape does not need to be the traditional rectangle. Use a shape that is totally offbeat. Many modern invites use different color writing rather than the black of traditional invitations. Also, remember that modern invitations tend to include not only the basic information that a traditional invitation would include, but also additional information such as registry info, directions, style of attire and if the wedding is a destination wedding, interesting facts and things to do in the area. No matter what type of invitation you choose, be sure to personalize it with your style and make it your own!